Peter Jackson's King Kong is all things cinema, in the hands of a clever but overindulged filmmaker. 187 min. Universal Pictures. Director: Peter Jackson. Cast: Naomi Watts, Jack Black, Adrien Brody, Thomas Kretschmann, Colin Hanks. Peter Jackson's King Kong is all things cinema, in the hands of a clever but overindulged filmmaker. By lovingly remaking Merian C. Cooper & Ernest B. Schoedsack's groundbreaking 1933 monster movie, Jackson has remade himself in the image of at least two of his leading characters. Like Hollywood filmmaker Carl Denham (and his successors Francis Ford Coppola and Werner Herzog), Jackson obsessively pursues the goal of capturing Kong on film. Despite his much-publicized weight loss, Jackson also resembles the four-ton gorilla you just don't mess with; for much of the new Kong, Jackson grasps his audience in the palm of his hand. With J.R.R. Tolkien's Lord of the Rings saga, Jackson could lean heavily on his source's storytelling discipline, but Jackson takes Cooper's lean, 100-minute Kong as an invitation to embellish. In a dazzling opening sequence, Jackson establishes Depression-era New York to the Al Jolson tune of "I'm Sittin' on Top of the World" (did I mention Jackson is clever?). Vaudeville entertainer Ann Darrow (Naomi Watts) enjoys the artistic and personal protection of a kindly mentor until waning business shuts down their theater. Left impoverished and all alone in the world, Darrow is easy pickings for the aforementioned Denham (devilish Jack Black, miscast), who needs a leading lady for a location shoot. Coincidentally, Denham has purchased the screenwriting talent of Jack Driscoll (Adrien Brody), a Broadway playwright for whom Darrow had hoped to audition. Lying, bribing, hijacking talent, and dodging police, Denham nevertheless gets the steamship Venture to sea in a mad quest to find the fabled Skull Island. Though the island has been untouched by civilization, scary stories have reached the crew, including live-animal-capture expert Captain Englehorn (Thomas Kretschmann), Hayes (Evan Parke), Lumpy the Cook (Andy "Gollum" Serkis), and the skittish young Jimmy (Jamie Bell). On the way, matinee idol Bruce Baxter (Kyle Chandler) and Denham's right-hand man Preston (Colin Hanks) enjoy blissful ignorance. Of course, Skull Island is home to Kong (played, via motion capture by Serkis), as well as a lost world of dinosaurs and a large populace of natives. Jackson goes out of his way to make his natives not only exotic and a bit scary, but creepy and inhuman (just try not to think of Rings's Uruk-Hai); that's a mistake, but at least Jackson and co-screenwriters Fran Walsh and Philippa Boyens explore the theme of conquering, one which puts Denham and his willing partners in a decidedly negative light. Beside conquering the island and, eventually, Kong himself, the heroes must conquer their own fear and self-doubt. In an apt but somewhat over-insistent conceit, Jackson has Jimmy reading Conrad's Heart of Darkness, asking, "It's not an adventure story, is it?" Jackson's extravaganza is more than an adventure story, both in excess and genre scope. Jackson's King Kong is a fantasy that plays dramatic, comedic, and romantic notes; it's also over three hours long, with the large cast running the acting marathon with impressive earnestness. The portentous first act effectively establishes the three human leads, proving Denham will stop at nothing and drawing together Driscoll and Darrow. The repetitive midsection, fraught with peril, develops a romance between "the beauty and the beast." (Since Darrow also makes eyes with Englehorn in Act One, it's fair to say that she's in love with love.) The third act's New York homecoming allows Kong to take Manhattan, and scale the Empire State Building for an iconic showdown with gun-equipped biplanes. Aside from King Kong being a needless remake, it remains a compelling yarn of man's reckless drive to confront nature, and courage in the face of the subsequent dangers. Jackson delivers several memorable moments that touch on the brilliance many critics have rushed to identify here. The best is a brief scene of Ann in Kong's sleeping embrace when her other lover, Jack, arrives to steal her away. Jackson typically overkills the sequence with giant vampire bats (or are they, as in 1933, pterodactyls? ), but not before he most effectively anthropomorphizes Kong and draws the parallel of the equally inarticulate "primitive" and "sophisticate" in love with the same woman. The romance angle between Ann and Kong is dicey stuff (or, if you prefer, "bullcrap") that Cooper wisely made a one-way infatuation. Still, given that Jackson and company were going to follow this thread, they work hard to earn it (too hard: when Kong does ice dancing with Ann, you'll be thinking, "Oh, just get to the top of the Empire State Building already"). The gamely windblown Watts helps to sell, emotionally, that Ann would try anything—even her vaudeville routine—to confuse and pacify the beast, and her gratitude after Kong protects her from two T-Rexes (in the film's bravura action scene) is equally plausible, to a point. But Ann's repeated, animal-rights-minded protectiveness of Kong, at the expense of her own life, takes a major leap of faith that a couple of shared sunsets don't quite cover. The filmmaker Jackson most conjures here is Spielberg, and not just because of the Jurassic Park echoes on Skull Island (after all, the Jurassic Park films aped the original Kong's best moments). The first glimpse of Skull Island's massive, man-built wall, backlit in the fog, is pure Steve, as is the inebriated operation of heavy blockbuster machinery. The gross-out "Spider Pit" sequence unleashes creepy-crawlies in one-upmanship of Spielberg's Temple of Doom and its offspring (The Mummy remake, et al). Jackson's version of a dinosaur stampede, crowded into a ravine, certainly will remain in the memory, as will Kong taking apart a Broadway theater (the special effects are truly special, though you'll tire of seeing Watts whipped about like a rag-doll). Denham promises, "There's still some mystery left in this world and we can all have a piece of it for the price of an admission ticket." But the problem with Jackson's Kong is its lack of mystery. For all its feinting, Kong offers no shades of gray—we always know exactly what gut reaction and what emotion we're meant to have. Those who've seen the original and (heaven forfend) the previous remake of 1976 may find themselves yawning as Jackson prolongs the inevitable. Modern-day wide-eyed kids will be just as gobsmacked by Kong as Jackson was as a child, but adults will have to meet Jackson halfway to enjoy his indulgent, chest-thumping tribute, which makes the narrative sensibility of romantic fable an afterthought to the exhausting intensity of frantic action scenes. 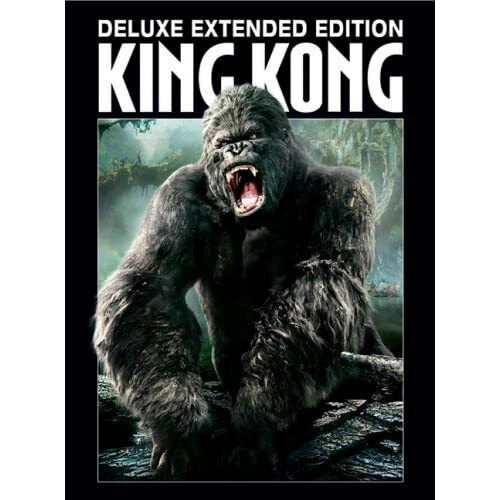 The Blu-ray debut of King Kong—from Universal Studios Home Entertainment—includes both the Extended Edition and Theatrical Version. Both look simply amazing in next-gen hi-def: I suppose a film with this many special effects is bound to have a clean digital source: this one is sharp and colorful, highly detailed and free of digital artifacts. A DTS-HD Master Audio 5.1 soundtrack has plenty of oomph, delivering the film's effects, music, and dialogue with definitive clarity and immersion. The Deluxe Extended Edition DVD had a slew of bonus features, while this initial Blu-ray release has a much quieter package of extras. The feature commentary with director/co-writer/producer Peter Jackson and co-writer/producer Philippa Boyens returns; it's a thoughtful track, beginning with Jackson's pledge to try to cover ground not already covered in the documentaries. Although those DVD documentaries aren't included here in their original form, much of the material has been repurposed in the U-Control Picture in Picture feature. Universal's patented U-Control makes bonus content accessible either directly from the U-Control menu or on the fly during playback (with U-Control enabled). This disc's U-Control (on the Extended Edition only) includes a Picture in Picture option that includes cast and crew interviews as well as set footage, and The Art Galleries, which offers pre-production concept art, also in a PiP fashion. Naturally, there's also a My Scenes bookmarking feature, which BD-Live enables the viewer to share with friends online. Peter Jackson fans will thrill to his hi-def upgrade, though the disc's construction leaves in doubt whether a future Blu-ray edition will restore the original bonus features. All site content © 2000-2019 Peter Canavese. Page generated at 04/17/2019 06:55:16PM.